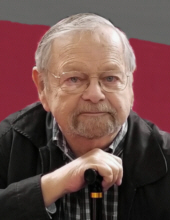 Thomas G. Howse, 78, of Middletown, died Friday, January 18, 2019, at Atrium Medical Center. He was born in Hamilton on June 1, 1940 to parents Charles S. and Alberta (Wilson) Howse. Tom worked as a computer programmer for AK Steel for 38 years, retiring in 2004. He was a veteran of the United States Air Force. Tom was a member of Middletown Pacemakers Car Club. Mr. Howse is survived by his wife, Sonia Jayne (Moore) Howse; son, Gary (Leeann Stone) Howse; daughter, Diana (Clyde) Gibson; and five grandchildren, Tyler Howse, Travis Howse, Shelby Howse, Zackery Gibson & Jacob Gibson. He was preceded in death by his parents and brother, William Howse. A Gathering of Family & Friends will be held Saturday, January 26, 2019 from 4:30 – 5:30 pm at Edgewood Baptist, 1010 West State St., Trenton. Memorial donations may be made to Middletown Pacemakers Car Club, 4925 Manchester Rd., Middletown, Ohio 45042. To send flowers or a remembrance gift to the family of Thomas G. Howse, please visit our Tribute Store. "Email Address" would like to share the life celebration of Thomas G. Howse. Click on the "link" to go to share a favorite memory or leave a condolence message for the family.